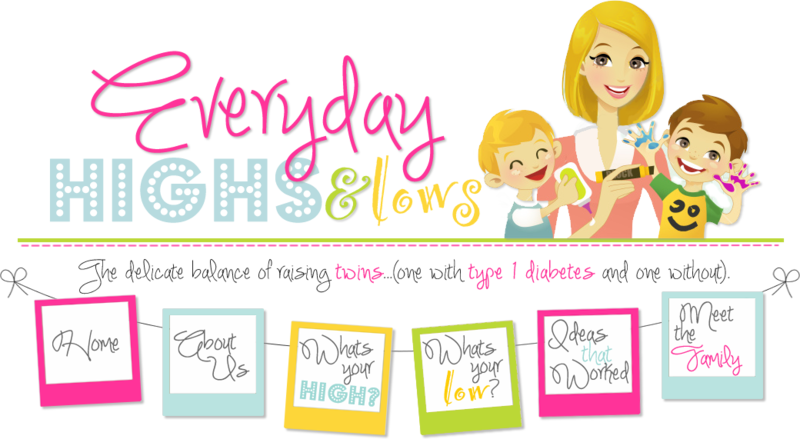 Everyday Highs and Lows: Whats your low? The "no one on this site knows you so why not just put it all out there" you. This is the spot where you can write your "low" for the day. For example: if your daughter just broke your heart because some stupid kid at school called her Robot Girl because of her pump, put it here. We, the parent community, are here for you. Just post, you will feel better. Rocco is 436 after stupid class Christmas party! So hard to know how much to push your children into something that is good for them that they have no interest in. Rocco's a1c was higher than last time. :( I guess all that sitting at school is effecting him. :( My 4 year told me that his insulin shots "hurt a lot and not a litte." I don't know how to help him with the arm and leg shots. He's ONLY ok with his hips but we have to rotate! Poor little guy! You can always ask the doctor for numbing cream (EMLA) cream or use "magic ice". Which is just an ice cube to numb it before the shot. Love to him! Every so often we have to hold down my son (dx apr/12, 7yo) to do finger pokes and insulin. This morning was one of those days. Hard to take when I had to drive him to the children's hospital because he was showing 'large' Keytones in his urine. After the one hour drive to get there, we sat for 2 1/2 hrs, I checked his sugar and Keytones at 2 am this morning and he was showing negative. Not sure what happened and neither was the dr, but it was certainly a scare! Hi Jan, I am so sorry that sometimes the finger sticks and insulin administration are hard for your son. I can only hope he will use that fighting spirit to fight off all the negative things that can happen from this disease throughout his life. Those darn keytones can be tricky! Thanks for sharing! Sorry Anonymous, I accidentally hit delete instead of publish but here is your post! Thanks for posting and I know how a mystery "HIGH" can drive girl crazy! My low is when my daughter is "HIGH" on her meter with ketones, We don't usually have a clear reason why she's suddenly so high and it is so difficult to bring her down. Usually, it is followed by hours of lows, which are equally as frustrating! Doh! Darn it! If you live close to me, I can give you strips! My kids don't have diabetes. But here is my "low" of the day - yesterday my middle child who is 4 made me a book while I was at work. Page 1: "I hope you don't have to go to work next summer." Page 2 - I want you to play outside with me." Page 3 - "I love you." *sigh* nothing like Mom guilt. I am trying to get my daughter on the pump. I was just about to give Medtronic $2500 for the pump, supplies, CGM and Sentry when the doctor's office called and said insurance will not cover a 2 night/3 day hospital stay that is required by her doctor. The stay is $2800 per night. Who has $8100 just laying around? So now I am in the process of finding a new doctor that does not require a hospital stay for training. I was wondering what other people had to do to get the pump and the proper training. Well hello there. I am a mother of boy girl twins, about to turn 6. Chloe has Diabetes and Max doesn't. My constant low is Max's lack of confidence generally in life. Chloe is a trooper, great with her pokes and shots, and super confident all the time. Poor Max gets compared to her and then has to deal with her getting all this special attention all the time. I am curious to hear ways other parents have dealt with this. He has a therpist now, but I need all the help I can get. He is such a good and wonderful child, but he thinks he isn't! Its killing me. Thanks Shari!! Medtronic was a great help and we have an appointment with another Dr in a few weeks. I love reading your blog because my daughter is the same age as your boys and it helps to have someone who seems to go through exactly what I do. Thanks for sharing all your experiences!! Ugh! Poor max! I just ordered a book recently called "Thicker than Water". It is a book about siblings of special needs kids. I, too, am always concerned about Zeke. How much attention does he miss out on? I know we love them entirely but do they always feel our love? It is a good topic for a post. Once, I read the book, I will blog about it and maybe we can all share stories and help each other. Thanks for your comment. I feel your pain. I'll try to help. Stacey, how did it all go? Do you have all the goodies yet? Ugh! Mel, I don't know how you are doing it! Being a single mom of twins must be really hard. Please, know I am thinking of you and rooting you on! You can do it! Hope I can help make you laugh sometimes! Abigail got her pump on Oct 10 and she loves it. We definately have a lot more freedom. We are still getting used to the site changes but other than that things are great. Thanks for asking!! WAY TO GO Abigail!!! What an accomplishment! The pump is such a nice tool in the world of diabetes! Stacey, try to ask your doc about EMLA cream for the site changes. It numbs the skin. Way to go, too Mommy! I know how scary starting the pump can be! Thanks for "shari"ng! Hi Tami, I am so sorry about you and your son Caleb feeling the effects of the long term complications of T1. I wish I had some advice for you. I have never told Rocco or Zeke about "what could happen". Since he's had it since he was only 22 months, he was always just too young to know. Not sure when I will finally have "the talk" with him. I do know that my father-in-law has had diabetes for 35 years and is now 67. He has no complications! At all. He has been wonderfully diligent about his control and that has resulted in a happy retirement! Since I haven't had the experience to answer your question, I am going to do what I like to do - ask my Dpeeps! So I am going to put up a post to have the more experienced parents give you guidance. Thanks for opening up and sharing on Everyday Highs and Lows! I appreciate the trust you give to me and our readers! It's really important for kids AND PARENTS to know that all those stats on complications are from the PAST. And even the near past, things were different. Back when my daughter was dx in the 90s there was no rapid acting insulin, no lantus, kids were almost never on pumps, meters were big and took a minute to count down and didn't work as well (not tht they are perfect now but still) .... there was no using ACE inhibitors to ward of kidney issues .. it has all changed. If you study the stats for the future (the suggested stats) then you will see that really, almost anyone living in a first-world country who has T1D iws NOT going to suffer complications. You need to let your son know this .... we all need to let our kids know this. This is one of the many reasons I don't like endos or parents using it as a threat or "reason" to turn things around when a kid is in burn out. Because 1) it's not totally true anymore and 2) the kid just thinks (wrongly) "Well I'm ruined and screwed so why bother." PLEASE share with your son that his data is old ... that it all has changed. And that he is going to live as long as anyone without diabetes and be healthy. he's going to have to do his daily care and for that we want a cure ... but things have changed for the better. My daughter had elevated kidney and liver things when she was in her teens. when we went to an adult endo he said "You know this is not permanent, right" And we were like NO, we DON"T. Well, he knew. And he was right. She's an adult now and FINE. all labs fine, no more meds for that stuff. Please share with your son. My daughter is 7 years old and was diagnosed at 2 1/2. She has seen the commercials and has heard about potential complications. I always felt since having diabetes forced her to take care of herself in a way most kids did not, that it also makes her mature enough for a brief age-appropriate discussion about the complications. One thing I realized over the last 6 years is that her feelings about her diabetes continued to change as she got older. As a young child she knew no differenty and I took it for granted that she appeared to have "accepted" it. As she got a little older she started asking when there would be a cure, and wishing she didn't have diabetes. I am sure as she approaches the tween/teen years things will be different. I feel so deeply for what you are going through as living with diabetes is a constant emotional roller coaster - that first year or two can be the toughest and most overwhelming to get through. But, once we started meeting other T1D families through camps and outreach programs we witnessed over and over again physically healthy, well-adjusted kids of all ages. They all had different stories to share about how diabetes has affected their lives, some of them heartwrenching, but we always left these encounters with positive feelings. That was when I knew that we can and will manage this disease, and that my daughter will be ok. Good luck with everthing and know that you always have support.